Emmy Huang (Product Manager, Flash Player) has made a confirmation that there will be a flash player 9 on Linux platform soon. Up to now, the current flash player for GNU/Linux is 7.x, while Windows version has been updated to 8.x. The player is now being developed in Adobe Labs and hopefully there will be a pre-release before the end of this year and after receiving some feedbacks from the testers and users, they will fix it and release it in early of 2007 (would it be a nice gift for new year?). A significant component of this release is a brand new, highly-optimized ActionScript Virtual Machine (AVM) known as AVM2. AVM2 is built from the ground up to work with the next generation of ActionScript (ActionScript 3.0) to support the needs of rich Internet application developers. The new virtual machine is significantly faster, supports full runtime error reporting, and industry-standard debugging. It includes binary socket support, allowing developers to extend the player to work with any binary protocol. Flash Player 9 also contains AVM1, which executes legacy ActionScript for backward-compatibility with existing content. Some people had been waiting for the upcoming flash player 8.5 for GNU/Linux platform since last year (December 2005), but it isn't available up to now. It makes some site broken when viewed with GNU/Linux platform, since they don't have a minimum requirement to view the flash. Stacy Young had put a comment in May 2006 that the 8.5 version is being renamed to 9.x (perhaps to syncronize with Windows' version) and it has been stated in Emmy Huang's blog either. There is an alternative for this, as it's being developed by GNU Project. It's called Gnash. This standalone flash player is being heavily developed and it can support many SWF v7 features (that means, we are lacking 1 version behind compared to Flash version that has been upgraded to 8). Today, i was quite busy. Besides collecting all the remarks for the OWG project and updating the documents (also fixing some bugs), i also start working on the Wiki pages for ooo-id project. At first, i have some problem installing Wiki at the Sourceforge, since it has restricted access and some features are disabled. Later on, Charles-H. Schulz, lead of the Native-Language Confederation of OpenOffice.org project told me to make a Wiki page at OpenOffice's Wiki page. So i started yesterday and today i continued it and finally some of the information needed by newcomers to join ooo-id project has been available. The main page of the project has also been redirected to this page. I will keep it updated regularly and if you have some suggestion to be put on that page, please mail me. I will put it as soon as possible. Two days ago i read a news from RSS which said that Google will release Picasa will be available on GNU/Linux. I visit the Picasa's homepage and i didn't find any link about the GNU/Linux version, so i waited a day and finally they released it officially on their website. Yes, Picasa for GNU/Linux is now available, thanks to CodeWeaver who shares their code and being optimized by Picasa development team in order to make Picasa running at GNU/Linux platform. I have installed them and it worked nicely, even though some features are missing, such as burning to CD, backup, and export to TiVo. I also notice that it took longer time to open a big photo (such as original photo from digital camera), but i don't think that's a big problem, as Picasa currently are running using optimized and modified version of Wine. The menubar interfaces are not as good in Windows, but you will get used to it as most of the function can be called without using the menubar. You don't need many packages in order to install Picasa, as most of them are normal packages, such as GCC 2.3 and higher, working X11 display system, GNOME and KDE (for integration only, you can use other Window Manager, though), and kernel 2.6.13 and HAL 0.56 above if you need automatic camera detection (though some camera failed to be automatically detected by Picasa). 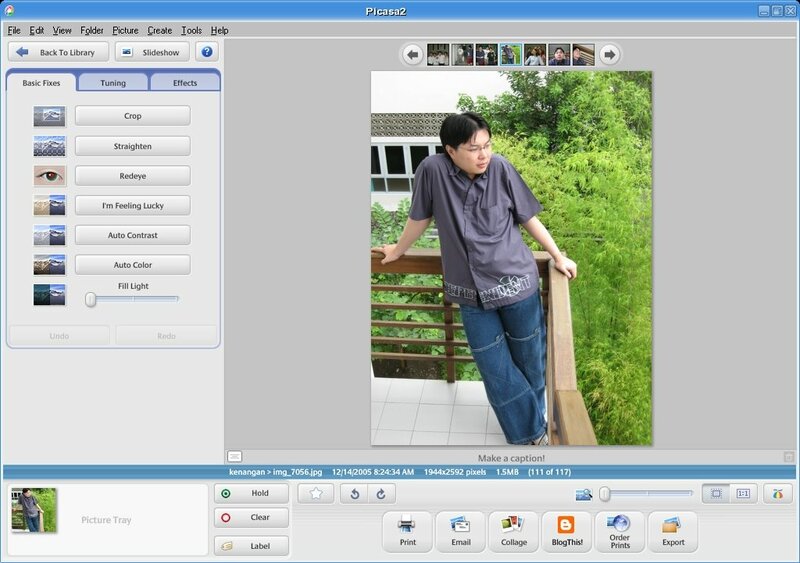 Besides of the inactive function, all of the function implemented in Picasa were running well. I can add star or label, giving a sephia effect, rotating the images, making movies, slideshow and others without problems. The only problem i encountered was when i tried to make a screensaver by using this application. It didn't work on my system, and i'm not suprised by that, since it has been stated in the FAQ section that there are so many different implementation of Screensaver in GNU/Linux, so i should read the documentation carefully in order to make this works (but i doubt i will do that, as i never use screensaver on my laptop. I usually close the monitor when i'm not using it). Nice job Google. I'm waiting for other application to be ported to GNU/Linux platform. Today, there has been a lot of updates in OpenSource development. Slackware-current has updates some of it's library to the latest one (preparing for the next Slackware release), GCC introduces GCC 4.1.1, a bug-fix release for the GCC 4.1.x version, Mozilla released Bon Echo Alpha 3 which soon will be Firefox 2.0, Google Summer Code which now receives more than 630 Open Source projects, and the most wanted news is now Picasa is being released in GNU/Linux platform. It has three kinds of format packages, RPM (RH/FC, SuSE, Mandriva), DEB (Debian, [Ku/U/Edu]Buntu, and BIN (other x86 Linux platform). This morning (6 AM) i got a phone call from my girlfriend, saying that there was a big earthquake in Jogja. I was suprised and then i called my mother. She said that everybody was fine, only some roofs were broken and her room was messed up because of the earthquake. It was a big one, with 5.9 richter, even though it only last for 57 seconds. You can see the detail in USGS Earthquake Hazards Program. My girlfriend asked me to buy a voucher, so she can keep in touch with others, since all phone was dead and couldn't be contacted. I called some of my friends, and they were OK (that's a good news), but i wasn't able to call everybody, since the line was busy. I went to take a bath and i rushed to the office to see the news on the Internet, but the server was down again. So i shut it down and clean it first (it's a little bit dusty) and replace the AGP VGA Card with the PCI (this was the main problem). After i switched it, it went back online without any problem, but the problem wasn't finished. I forgot to remember the cable position, as there are 2 cables, one for local area network, and the other for the ADSL connection. After a little bit of trial and errors, i finally made it and all Internet connection has come back online. I'll stay at the office to monitor the situation and read some news on the Internet, because it's not safe yet, as i'm very anxious about another earthquake and a possibility of floads or even tsunami again (we already had enough with Aceh last year which blowed up everything). Linus Torvald has just released another RC (Release Candidate) for 2.6.17 and he hoped that it will be the last RC before the final 2.6.17 will come out soon enough. I have read some of the changelog and Andrew Morton has tried to fix some warning in compile time, and there was a discussion on KernelTrap about this. It started when Daniel Walker insisted that warning messages should be dissapeared in compile time by the compiler, but Alan Cox answered that if any warning is generated, then in the future, people will look for the code and reviews it again. If there are no warnings/errors, nobody will look for it again in the future and it's still there. Greg-Kroah Hartmann (one of -stable kernel maintainer) has just released a Linux Device Driver Kit which was made based on the latest kernel available up to now (2.6.16.18). It is a cd image that contains everything that a Linux device driver author would need in order to create Linux drivers, including a full copy of the O'Reilly book, "Linux Device Drivers, third edition" and pre-built copies of all of the in-kernel docbook documentation for easy browsing. It even has a copy of the Linux source code that you can directly build external kernel modules against. * searchable index of all documentation. * prettier web pages with CSS support and images. So, if you can do one or all of them, please let him know and start working on it. You can download the ISO freely. OpenOffice development team has released another RC for 2.0.3 version and it's getting closer to the final product of OOo 2.0.3 which will be released in June (i hope). There are a lot of changes, including in help section (that will affect the translations as well, as you can see in helcontext directory in ooo-id's CVS Repository). You will notice that in this release, much of the help section was requested or contributed by other people as well, so it proves that OOo is not just owned by Sun Microsystems, but also owned by the community. Let's just wait for the final OOo 2.0.3 version next month. New NVidia driver for GNU/Linux and UNIX platform has been released. It's quite amazing for me, since the update to the last release was over than six months and this release was less than 2 months (i think). Most of the changes in this version are bugfixes and also support for new cards. I hope that this version will be compatible with the latest Xorg package X11R7.1 which has just been released today and also the upcoming 2.6.17 kernel. * Added support for QuadroFX 4500 X2, Quadro FX 5500, Quadro FX 3500, and Quadro FX 1500. * Improved Quadro FX 3450/4000 SDI support. * Fixed video memory reporting with GeForce 6200 Turbo Cache. * Fixed a problem with Overlay support when in TwinView. * Fixed problems starting X with SLI Frame Rendering on nForce4 SLI Intel Edition. * Fixed multiple issues with combinations of Stereo, SLI, FrameRendering and G-Sync. * Fixed several issues with mode selection for CRTs and DFPs. * Fixed a corruption problem with Rotation and large desktops on older GPUs, including GeForce4 MX. * Fixed a system crash starting X with TwinView on certain GPUs. * Addressed an NV-CONTROL compatibility issue; please see the Known Issues section of the README for details. Today i found an interesting application that is designed for GNU/Linux and Windows platform to run a point of sale application. It's called TuxSoft Point of Sale which is made by TuxSoft Business Solutions. TuxShop is a modern point of sale and retail management application. It is feature packed yet still manages to provide an interface that is as simpler than a cash register to operate. You can download them in .ISO files as they want to get rid of installation problems. So, if you want to open a retail and you want to use GNU/Linux as the operating system, try this product for the Point of Sale application. New GNU/Linux stable kernel has been released by Chris Wright after several days without new releases. It contains much more updates and fixes than the previous version which was only one or two patches. You can see it by looking at the Changelog or the Incremental Patch Viewer where this new kernel contains more than 200 insertions, 96 deletions, and 25 files has been modified. I'm downloding this version, as it contains some important fixes on filesystem, USB, and some other components which can affect my system. It will be a quite loop, since i'm currently using 2.6.13 kernel and i'm quite happy with that version as it was quite stable for me and no major problem has arose up to now. I had no special activities today at night so i have some spare time time to do one of my favourite activities which i rarely do it anymore which is learning PHP. I used C# as my default language at work, so it's quite different with PHP itself and my main project is desktop application, meanwhile PHP was intended to build a web-based application (even though there is a php-gtk project, but i haven't tried that yet). Since i have upgraded my PHP in my Windows system up to 5.1.x, i should try to learn the new features that are available in PHP 5.1.x version. I have read some of the Object Oriented functionality in PHP 5.1.x and since i have some basic skill of Java and working with C# which uses Object Oriented style also, i can understand most of them, except for some special syntax which is quite different. Today i tried to learn about cURL library to get the content of an URL which contains a XML file (mostly RSS, since i want to make a code that parses RSS file or you can name it RSS Grabber) and then i will parse it and output it as a formatted HTML code, but as i tried, i haven't find a perfect solution to send cURL handler resource to another function which expect a file name as the parameter. So i switched to use fopen() function to try open the XML file and then parse it using the DOM function. It has used an Object Oriented style, but it still contains some old function which hasn't been converted to Object Oriented style and should be avoided (as written in PHP Manual). Well, it worked for me now after looking for examples in PHP manual, but i'm still updating it so it will have better output results by giving the correct CSS code. I plan to put it in Informatix website. It will grab file from another RSS Feed and display it in the page, just like PlanetPlanet website. amaroK 1.4 (aka Fast Forward) has been officially released by the amaroK team after three beta releases. This is (perhaps) the last version of amaroK before the next amaroK (2.0) that will be built with Qt4.x that should be shipped with KDE 4. I have asked Patrick Volkerding to provide this package in -current tree and i think he will ship this application as it is ready and tested in his machine. As owners of AAC, WMA and RealMedia files found out, tags in such files weren't supported in amaroK 1.3.x series and earlier. As a consequence, these types of files weren't added to the collection and there was no advanced features for them, such as collection search, album covers and statistics. Taglib has since been improved, and these files are now fully supported. One of the unique features of previous versions of amaroK was the possibility to automatically fetch lyrics for played song. Now amaroK pushes the limits even more, with its new scriptable lyrics support. Each lyrics source is handled by a script, so it's possible to fetch lyrics from practically any site. AmaroK is bundled with few of them, but everyone can create his own, or enhance exiting ones. Media device support has been thoroughly reworked. AmaroK now supports iRiver iFP as well as generic vfat USB devices, and features much improved iPod subsystem. Available podcast episodes are stored in the database. This makes podcasts first-class citizens in amaroK and enables contextual information for podcast episodes, including the podcast's logo and other episodes from this channel. One of the most annoying aspects of earlier versions of amaroK was its inclination to crash during a collection scan if a track's tags were damaged or otherwise unreadable. Now, the whole collection scanner has been moved into a separate process. If any problem occurs, amaroK skips the offending file(s) and lists them at the end of the process. The collection scanner can also be run outside amaroK, making it simple to set up a regular cron job to update your collection. amaroK now supports gapless playback in the xine engine. Requires xine-lib >= 1.1.1. One of the first changes that amaroK users will notice, is the lack of "Home" tab in Collection browser. The developers agreed that 4 tabs was too much for usability, so it has been dropped in favour of a new Statistics dialog (available under "Tools->Statistics"). Assuming you have a KDE installation with audiocd support, which should be shipped by any common Linux distribution, you can now drag'n'drop the audio files from Konqueror or the amaroK file browser to the Collection tab to get amaroK rip them right into your Collection folder. Track popularity has been separated into "Score" and "Rating". Score is calculated by amaroK, changes dynamically, and is represented by a progress bar, while Rating is user-defined, and shown as gold stars. amaroK has always motivated users to keep their music tags clean, however, until now, had no way to organise the underlying filesystem structure. amaroK 1.4 introduces the elegant "Organize files" tool. Quickly create a tag-based directory structure (customizable with variables) so you can find your files easily, even when you're outside amaroK. The Track Information dialog has had a serious face-lift and is now more powerful and simpler to use than ever. A wide range of information about individual tracks is categorized into tabs for tag editing, album covers, statistics and a lyrics editor. The inclusion of a new flexible tag-from-filename guesser is sure to make life easier. Wikipedia's locale in amaroK is now configurable to allow results to be displayed in any language you like. When you drag a track from one place to another its album cover shows under the cursor. Displays up to 4 covers when dragging multiple tracks, as well as how many tracks in total are selected. A new release of amaroK deserves fresh artworK, including a new splash screen, no-cover image and custom icons. To make life a little easier for non-KDE users, setting the default Web browser that amaroK uses for external links does not require kdebase anymore. This setting can now be changed via the amaroK config dialog. Forgotten the name of that track you just added? You can use the new "Statistics" tool to check the "Newest items", or more simply, try the time-based filters on the collection sidebar. Click on the "Entire Collection" pull-down menu for a selection of time periods. "Related artists" is similar to "Suggested songs", however it is not limited to the user's collection. This new addition to the Context Browser shows a list of last.fm related artists, which, when clicked, displays that artist's summary page. If you don't have a media device, there's no point displaying the media device tab, and this, like all the other tabs, can now be hidden or shown at will. Just right-click on any sidebar tab and toggle the tabs on the context menu. Have you ever felt that there is too much information in the Context Browser? Adjust the amount of information shown by right-clicking within the Context Browser and toggling the various sections on or off. Information on the collection tab can now be displayed a number of ways. Users may already be familiar with Flat View and Tree View, In Tree View you can toggle collection dividers on or off, depending on your preference. Sourceforge's CVS Service has another Partial Outage, which was failing disk for some projects starting with the letters g, i and k and anonymous pserver projects starting with a and p has failed (taken from the Site Status of Sourceforge.net). It has generated a new key for SSH Authenticating also and people are asking this (including me), because we suspect that there was a man-in-the-middle attack. Up to now, there hasn't been any further announcements about this, so people will keep asking about it. Let's hope they will update the Site Status as soon as possible to clarify this. ( 2006-05-17 12:04:02 - Project CVS Service ) As of 2006-05-17 at 12:00 Pacific we synchronized the SSH keys on all of the CVS hosts. This will cause SSH key mismatch errors for most projects. Please reconfirm the new SSH key against site doc G04 (https://www.sourceforge.net/docs/G04) and then accept the new key, if it matches per normal procedure. We apologize for the inconvenience, but this should be a one-time event and make future CVS infrastructure changes more seamless. ( 2006-05-17 12:01:45 - Project CVS Service ) As of 2006-05-17 at 12:00 Pacific, all CVS hosts are back up and fully operational. The disk issue on one of the hosts forced us to swap it out for a backup host to send the hardware back to the vendor for further troubleshooting to identify the cause of the continual hardware issues with the systems. As we had to switch to the alternate host, a very small number of checkins may not be present on the host. We recommend that affected users make a fresh checkout, copy their working copy on top of the fresh checkout, and then commit those changes back. If you didn't make any changes in the 20 minutes or so prior to the outage, this should be unnecessary. My girlfriend has just started her new business by buying a Kebab franchise license and start selling it. Yesterday was the opening day and she was very busy so that she couldn't be reached by phone (i usually called her everyday using my Fren). She called me back at 1 AM today, but i have slept, since yesterday the OWG team had worked hard to fix as much remarks as we could. I'm glad that her business was running smoothly at first and she had confident on herself about her business. I hope this can last not only in first day, but forever. Too bad i couldn't be the first customer, but that's not a big problem, as i can try it when i got back to Jogja later on. Today i had to finish a lot of remarks that Frank had sent yesterday. There were two 2 remarks for two modules and we (me and my colleagues at OWG team minus Yuni which was sick and Mr. Yenn which is taking day off today) agreed that at least 95% of one the remarks must be finished today. We agreed to start working on the TOP100 Part3 first and we have completed most of the remarks today, as there are some unclear remarks and some of them aren't translated yet (they're still in Dutch and i got a different interpretation when i tried the BabelFish to translate them). Some of the remarks can be applied to the other modules too, so some of them are inter-modules. Let's hope every remarks can be finished this week and we can send the updated version to the client. After doing some feature adding, Kurusetra has come back online and today is the first day of the game. It's now a testing phase, as the game will start tommorrow at 12 PM. But if you start tommorrow, you will loose some time that you can use to build buildings and your soldiers. You also have a chance to change your characters today as tommorrow the settings will be fixed and you won't have any chances to change anything anymore. Please keep in mind that if you change your character, your status will be reset again, so every building that your have built will be gone and you will have a new status. Just for your information, Kurusetra is a multiplayer web-based online game which was very famous in Indonesian peoples, since it uses Indonesian language. Basically, when you made an account, you will have a kingdom and you will have to build that kingdom along with other kingdom in your "dewan raja" (it's some kind of groups of kingdoms which is indicated by a number, for example 1:1). In one dewan raja, it usually consist of 15 kingdoms. We can extends our kingdom by attacking other dewan raja and gaining a special item called tongkat Tirtapawitrasari, but our leader must declare a war to that dewan raja or our dewan raja is declared war by other dewan raja. It has 8 creatures with 11 characters that you can choose when you create your account. And you can register a lot of accounts just by using one email address. Each creatures and characters has it's own advantages and disadvantages. You will have to look for the manuals to know about them all. Just try it, it will be fun. Upgraded to Linux 2.6.16.9 kernel source. I'll start playing the expansion packs today and let's see if there is a big improvements on it. Yesterday i saw a post in my cBox at my personal web which asked me to check some url in my web which has been modified. I'm curious and test it and it ruined the index of the paging with a text "4 haiiiii". I knew that i hadn't correctly check the input from the query strings so i added new validation on it and now it has been fixed. Thanks to the anonymous person who told me that. I also found another bug after i did some addition testing on the previous bug and i managed to fix it also. Luckily i didn't use too much scriptings on my web page, so there shouldn't too much problem on it. The only problem for now is how to reduce spams in my guestbook, since GD library was disabled and i couldn't use Captcha again to make some image to detect whether the submitter is a person or robots (mostly are spammers). Few days ago i received a strange error on our project which deals with numbers and decimals (floating points). It displays a negative number when it should always be a positive number. I couldn't reproduce the error on my laptop and also in my friend's laptop, but my project leader can reproduce it on his laptop. That's weird, since we have the same program. Later, i found out that i used English regional settings while they use Indonesian and Dutch for their regional settings and this was the main problem. English uses dot to separate between number and decimal, meanwhile Indonesian and Dutch uses comma. It will affect how the number are calculated. Yesterday i tried to fix it but i couldn't find the best solution. If i fix in English, it will occur in Indonesian/Dutch and vice versa. One note using this solution is that this setting will be saved when the program started, and it will persists until the program ended, so if at runtime you changed your regional setting, you will get the old settings. The reason is because the setting is only valid for current thread, so if we want to change the setting, there are 2 approach that we can use, restart the program or check the setting and overwrite it. I'm taking the first option, since it's not common to change the regional setting while you are playing the game (mostly the users are students). Well anyway it's fixed. The culture is a property of the executing thread. This read-only property returns Thread.CurrentCulture. When a thread is started, its culture is initially determined by using GetUserDefaultLCID from the Windows API. To change the culture used by a thread, set Thread.CurrentCulture to the new culture. Changing the culture of Thread.CurrentThread requires a SecurityPermission with the ControlThread flag set. Manipulating threads is dangerous because of the security state associated with threads. Therefore, this permission should be given only to trustworthy code, and then only as necessary. You cannot change a thread's culture in semi-trusted code. I really wanted to see The Da Vinci Code movie since i have read the book and i want to see the visual version of it which will be casted by Tom Hanks (i was a Sonny Erickson promotion in Taman Anggrek which said that the movie will be available on May 19). The movie will be available in May 12 in other countries, but i don't know when will it be available in Indonesia, since it's not listed yet in Coming Soon section in 21Cineplex. I have read and collect all the Dan Brown's novels (Da Vinci Code, Angels and Demon, Digital Fortress, and Deception Point). In my personal opinion, only three of them are great. I kindda dislike with Deception Point. At first, i also kindda confused with the digital fortress, but after i know that it was computer-related topic, i started to enjoy reading it. I don't know whether the other novel will be available on movie or not. Today i played Shishen-Sho, one of the games included in KDEGame packages in KDE packages. It's a board game and the main goal of the game is to remove all block as fast as possible, because the faster you finish, you will get more score. Yesterday i have defeat my own record. For a long time, my best time was more than three minutes, but yesterday i managed to get less than three minutes (see the screenshot. It's not the latest screenshot. When i finish playing the game, everything was under 4 minutes). I do this without using right click (to locate the other card) or help (by pressing h to resolve the available steps). I was quite suprised, since i don't have any intention to beat my own record. I played the game to wait for my girlfriend, since she was watching MI3 (Mission Impossible 3) with her sister and some of her friends. This week, i wanted to find some resources about CodeBehind in .NET. It will be used to convert our project from desktop application to web-based application. While it's just an idea (not yet proposed), but it's better if make some planning on it so when it's decided, we have cut some of our development time to do some research on how to do it. The basic idea of CodeBehind is to separate your presentation layer (that will be your ASP.NET or HTML code) and your core program (the logic) that will be in C# because we have made the program in C#. So ASP.NET will call the C# code behind the scene and compile it and use it to process the data. That is why it is called CodeBehind. Well, this is the basic idea, but i need to get more on it as is is new for me, so i need to spend more time on this so that i get the trick to make the migration faster and smoother. Today i'm going to Bandung with my colleagues. We have planned this for several days and finally there are 5 people who joined this trip. They were me, Adi, Markus, Ronny, and Berta (Ronny's friend). We planned to start our trip at 7 AM when Ronny should start picking us, starting from me and Markus. I woke up at 6.30, but since i got sleey, i went sleep again until 6.45. I send a sms message to Markus and he said that he has already in the office since 6 AM (hm... suprising). So i took a bath and went to the office at 7 AM. When i got there, i had a feeling that Ronny wouldn't have woken up, so Markus called Ronny and we were right (he just got up after he heard Markus's call). He picked us up around 7.30 and we would pickup Berta first, but finally we picked up Adi first and then we picked Berta and start our journey to Bandung via Cikampek highway. We reached Bandung in about 1 hour and 35 minutes, quite a fast trip, since the highway wasn't that crowded as usual. When we got to Bandung, we went to Adi's cousin house and we picked (or probably 'kidnapped') Erwin to be our guide, since we didn't know much about Bandung. At first, i wanted to ask Sandy, my cousin to accompany us, but he was busy, so we picked Erwin. He was a big person, but he was still in his first year in high school (kids these days are bigger hehehehe). Our first destionation was Rumah Mode, a famous factory outlet in Bandung. It was my first visit, since i thought it only consists of women's dress, but actually it has men's also and i bought a nice shirt there (hey, i never bought shirt or t-shirt in Jakarta before, so it was my first experience buying something besides food and magazines). The price were cheaper than in Jakarta, so i decided to get one. The size were big enough for me, and it suited me well. Next, we went to Kartika Sari to bought some gifts followed by having lunch at some weird small restaurant. It hasn't got any name board, but people know the place well. Maybe they use mouth to mouth promotion. After lunch, we went to Pascal Hyper Square. It was my first visit also. Some store was still closed as it was relatively a new mall in Bandung. I got two new shirt here in de Cosmo, so totally i got three shirt. Next, we went to Amanda to buy brownies (only i, Erwin and Adi who didn't buy it). After that we took some shots near the Harley readers. Our last destination before having dinner as at Riau, where most factory outlets were there. Almost every building there were factory outlets, so you will need more than one or two hour to visit all of them. Of course we didn't have that much time, so we only visits Island, Cascade, Formen, and Summit. I didn't buy anymore shirt since i thought it's enough for me. We had dinner at near Erwin's house. We ate Rica-rica noodle. Most people said that it was so spicy, but in my personal opinion, it wasn't that spicy, but i have seen the proof that it was quite spicy for some people. Ronny was sweating badly just like he had just had a sauna. He also ate fried rice with Markus. After taking Erwien back to his home, we went back to Jakarta and this time, the highway was much more crowded, so it took longer to get back to Jakarta, but we managed to get into our home safely. What a nice trip. I wanted to go there again, but i also wanted my girlfriend to go with me also, since i know that she will like the place very well, since there are so many place to shop, nice weather, and also nice food. Good luck for the students and the mentor and i hope it will improve OOo's functionality and quality as one of the best Office Suite in the world. For several days, i couldn't do a local chat using local messenger, such as YaK or WinPop Lan Messenger. So i have to rely on Yahoo Messenger to have a chat with my colleagues in my office. The only problem is that Yahoo Messenger requires Internet connection while local chat only need a switch/hub to connect to each other. The problem was because the Windows's firewall was corrupt because of a trojan/worm which i had few months ago. I asked to Microsoft Community and i got the answer in less than 1 hour. I went to the site, grabbed the registry file, and applied the solution and the firewall works again and now i can have a local chat again. It was nice to have an answer in less then one hour, but if i use GNU/Linux, i wouldn't have this kind of problem as i never use firewall in my Slackware system. My system was directly connected to the Internet but i never got any problem like this. This is why i like GNU/Linux, mostly Slackware as my prefered distro since it was stable, robust, slick, and secure. Studies have shown it is ten times cheaper to move to OpenOffice.org 2 than it is to upgrade to MS-Office 2007. Most people who likes MS Office (mostly are companies) will ask about this values, but i'm sure OOo will not just make those statistics for nothing. They get the fact that OOo has a high demand from most users around the world who was tired of licence model that was implemented in MS Office and other Microsoft's products. So.. What are you waiting for? Get OpenOffice.org now and try it for yourself. I suggest that you download OOo 2.0.2 for now as this is the latest stable version for now. If you need documentation, you can access Documentation Project which contains HOWTO, Manuals, Setup Guide, and other links to other resources which can be used to learn OOo. Indonesian Documentation Project is also available. For marketting and support for Indonesian users, please visit Indonesian Native Lang project or join our mailing list at YahooGroups. Today, there are 2 updated application that were small, but still classified as top priority. There are Linux kernel and Mozilla Firefox. I noticed the updates for Firefox from Majorgeeks which list most of Windows-based application. I use the software-update mechanism to update my Firefox, but i still download the Windows and Linux version for my laptop which is offline. I read the release note for this release was for fixing 1 bug which causes Firefox to crash. Small changes, but it is important, since it will cause the application to crash, which was bad for users. The second application was Linux kernel which is now has reached 2.6.16.13, the biggest 2.6.x.y version i have seen (it probably gets more than this). In this version, it only consists of 1 patch from Patrick McHardy, but since it fixed an infinitive loops condition, it was considered critical and the maintainer of -stable team didn't wan't to hold any longer for another patch and release this as new version of stable kernel again. I have skipped the 2.6.11.12, and i'll skip this version also, since i was compiling the last kernel just few days ago, so perhaps i will take the 2.6.17 for the cumulative patches from Linus and -stable team. Today i found out that there is a new captcha system in Blogger which should be suitable for disabled people, but what makes me confused is that the sound produced is different with the text in Word Verification. How does it will verify when the captcha system is different? I don't know about this, but perhaps Blogger team will give the answer shortly. Captcha system itself was designed to distinguish between humans and robots (or probably spammer) filling form or register into free services. By creating a random images or numbers which can be viewed by normal people and not to robots, we can reduce a lot of spammers in our services. You can use GD library to create image-based random number so robots couldn't identify it by reading the source. Google Summer of Code has come back and now a lot of organizations/project has been participating by mentoring the students for ideas for the next event. You can see them in the Google Code's official home page. If you are interested, why don't you join them and participate on the project itself?